Supper had gone well, Will thought. He noticed that Reginald Monday told very little about himself, always skillfully diverting questions toward others. Due in part to that, and in part to David Graham's single-minded focus on his protege's career, Will found himself knowing far more about the apparently very mundane life history of Violet Perry than he would have ever wanted. Though he felt no closer to Monday than before, he had learned a few things. Under his brash, devil-may-care attitude, for instance, Cesar de Falco was afraid of something. Little things... the way he would sometimes glance around the room, as if expecting trouble, for instance. Captain Pelton had a fatherly way about him, just the sort of man you'd want to Captain a passenger ship, but he seemed somehow soft to Will. Vance worked for the U.S. government, but what precisely he did Will didn't know. He didn't seem the "G man" type to Will. Artie was happy with supper as well. Time spent with Lily, and without Cesar, could only be a good thing for him. But very soon, almost too soon, supper was over and it was time to play. Lily said, "Why don't you do one or two instrumental pieces first, kind of set the mood, and then I'll come join you." Nothing to add really, Will does use all his skill deflecting allegiance to any "side" as well. He'll maintain the pragmatic approach of someone who has been in business, that killing people is generally bad for business. War economy or not, after a war ends there are economic problems. He'll cite 1931, when the circular lending amongst the Allies collapsed, etc, to throw anyone away from getting details or allegiances from him. Solomoriah wrote: Lily said, "Why don't you do one or two instrumental pieces first, kind of set the mood, and then I'll come join you." "Sure thing." Artie sits down and starts to play. Mak wrote: "Sure thing." Artie sits down and starts to play. Artie began to play, and as he did he looked around the room, assessing the mood. Everyone appeared very relaxed, and he could see a few who seemed to be really getting into it. Then Cesar looked around, and excused himself from his place at the Captain's table. Artie watched as Cesar leaned over the empty chair beside Lily, wine glass in hand, chatting with her. Artie saw a disapproving look pass briefly over Emily's face, and wondered exactly what she disapproved of; but of course he could not hear what Cesar was saying. Lily was paying close attention to Cesar, laughing or blushing from time to time; she seemed to really like him. Artie's heart sank. But then, as Artie was wrapping up his second piece, Lily stood up suddenly. She was radiant, wearing a red dress with sequins, sparkly red pumps, and lipstick of the same shade; her creamy skin and pale blond hair seemed to glow. A string of pearls and matching earrings completed her outfit, but it was her natural beauty that really made her look. Artie tore his gaze from her for a moment, and saw the eyes of every man in the room on her. "Hey, Artie, I think it's time," she said, smiling on him like the Sun. "You start, and I'll keep up." Will Thornton was no exception to the rule... Even though she had been in the room for hours already, when she got up to sing it was like seeing her for the first time. But Will was always canny, and took the opportunity to look around at the other passengers. He saw the men all staring, drinks and conversations momentarily forgotten; and the women also, jealousy evident in their gazes. All but Violet... her expression was more a matter of appraisal than jealousy. She was the only woman in the room, Will thought, who might compare favorably to Lily. Glancing up, he realized it was much later than he had thought. Across the back wall of the lounge, directly in front of him where he sat at the Captain's table, were an array of clocks, telling the time in Paris, London, and New York, and by London time it was already just past nine PM. Then Lily began to sing. "She really is quite good," said Reginald Monday quietly. And finally, "All of Me" (1931), the big emotional finale. He alternates between slow and fast numbers, allowing Lily to shine. He's a good accompanist, never trying to hog the spotlight, ever seeking to match the mood and feeling of the singer or musicians he's behind. It's probably why I never made it big as a solo performer, he reflects for the hundredth time. But he doesn't care -- at least not right now, while there's a beautiful woman singing right beside him. They're connecting on a level far beyond words or even touch, and that's enough. Mak wrote: He alternates between slow and fast numbers, allowing Lily to shine. 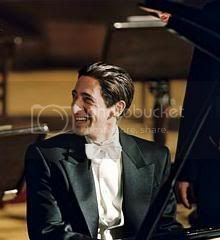 He's a good accompanist, never trying to hog the spotlight, ever seeking to match the mood and feeling of the singer or musicians he's behind. It's probably why I never made it big as a solo performer, he reflects for the hundredth time. But he doesn't care -- at least not right now, while there's a beautiful woman singing right beside him. They're connecting on a level far beyond words or even touch, and that's enough. There was applause when the last piece was over. Lily took her bows, then turned to Artie. "You were great," she said, glowing. "I couldn't have asked for a better partner. Thanks." Then she kissed him, a quick peck on the cheek. "Join me for a drink?" she asked. "We seem to have enough in the mug to cover it." When the music was over, several people called it a night. It was past ten London time, close to the watch change, so Captain Pelton excused himself to prepare for bed. The newlyweds were already gone, having left during the performance. Fern Lloyd excused herself, as did Phillipe and Doriane, Steve Vance, and Reginald Monday. At the long table on the starboard side, Michael Lloyd was deep in conversation with Dr. Burton and his daughter. Dr. Burton waved the steward over. "I say, Mister Greaves, I've a few questions," he said. "Is there a curfew aboard this vessel?" "Why, no sir," replied the steward. "The kitchen is closed, of course, but if you would like a beverage, or some nuts, just ask. Mister Brandon will be coming on shift soon, and he'll work until seven in the morning, so feel free to ask him if you need anything." "Thank you," replied the archaeologist. "Tell me, could I trouble you to assist me in getting a few things from my luggage?" Greaves smiled. "The Totem, sir?" "And another item or two, I think," Burton replied. "I'll help," said Michael Lloyd, rising from his chair. Tommy Mansel awoke suddenly, as he had learned to in numerous campaigns in less comfortable places. He saw Simon Lars, also awakening quickly; no one else was in the crew compartment. The radium-illuminated dial of the clock on the wall indicated that it was 10:33. There were people speaking in the corridor outside; with the door closed, it wasn't possible to hear them clearly. The voices seemed to belong to three men. As best as Tommy could tell, it was Lt. Sullivan, Third Steward Brandon, and Second Engineer Lusk. Simon stretches and gets out of the cot. He quickly dresses and heads over to a sink/shower stall to splash some water on his face and shave, brush his teeth, and all the other necessities. After which he will go to the kitchen to grab a quick meal. While doing so he will stay warm and friendly, yawning occassionally, and generally trying to appear as an effective crew mate. He turns to Tommy, "Coffee?" The room marked "Crew Qtrs." contains six bunks and precious little else. The smaller "Ship's stores" room next door contains the crew lockers. 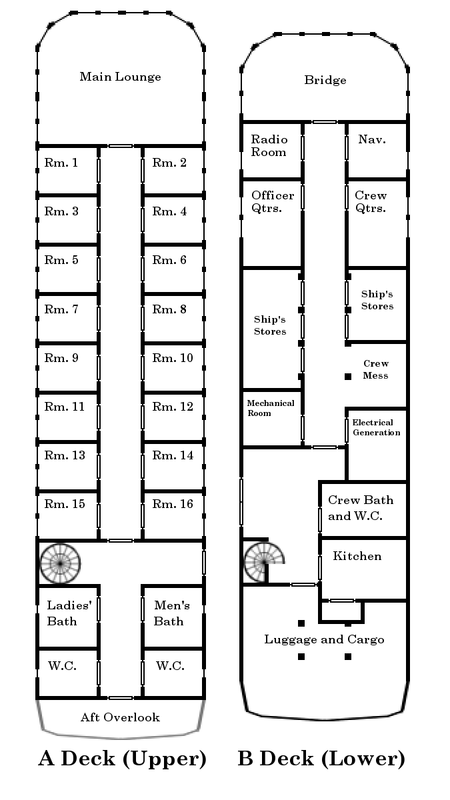 The open space labeled "Crew Mess" contains a table, two chairs (at the ends of the table) and two long benches (along the long sides of the tables). The "Crew Bath and W.C." room is where Simon would have to go to perform his stated "morning" ablutions. Rosisha: I'm going to interpret your orders in light of the above arrangements. If this doesn't work for you, please state that right away. Rosisha wrote: Simon stretches and gets out of the cot. He quickly dresses and heads over to a sink/shower stall to splash some water on his face and shave, brush his teeth, and all the other necessities. As he opened the door, Simon saw Lt. Sullivan, Mr. Brandon, and Mr. Lusk standing in the corridor conversing. The conversation came to a quick halt, and after a brief moment of awkward silence, Lt. Sullivan said, "Evenin', Mister Lars." "Lars, good, you're up," said Lusk. "We need to talk a bit before I go off duty." Sullivan turned and entered the officer's quarters, and Brandon went aft. As Mr. Brandon passed the crew mess, Lars heard a tenor voice call out to him. "Mister Brandon, I say, you must join us! The passengers ate prime rib for supper, and Sidney here saved some for us." "It's not every job that lets you have prime rib for breakfast, now is it, son?" came another voice. This one Simon could identify: Chief Engineer Green. "Sure, chaps," replied Brandon without stopping, "right after I wash up." Lusk said, "Now Lars, look here. I've completed the inspection of the upper works, and inspected the engines as well. I suppose your inspection of the generator this morning was thorough? Well, right, so here's the thing, a few of the male passengers have complained that the toilets are flushing rather slowly, and I'm concerned the waste system may be clogged up. I haven't had time to look at it yet. If you'd be so kind as to take a look, if you need help later I'll be available. When you're ready, of course." Rosisha wrote: After which he will go to the kitchen to grab a quick meal. While doing so he will stay warm and friendly, yawning occassionally, and generally trying to appear as an effective crew mate. After getting cleaned up and dressed, Lars made his way to the kitchen, where there was indeed prime rib available, not quite hot anymore but entirely palatable, with potatoes and vegetables as well, and even a berry pie of some kind for dessert. Taking his plate of food and a hot cup of tea, Lars proceded to the mess, where Chief Engineer Green and Chief Steward Bishop were just then clearing away their plates. "Ah, Mister Lars," said the Chief Engineer. "How are you getting on?" Rosisha wrote: He turns to Tommy, "Coffee?" This is directed at a player character, so I'll leave it to him to reply. Solomoriah wrote: Will Thornton was no exception to the rule... Even though she had been in the room for hours already, when she got up to sing it was like seeing her for the first time. But Will was always canny, and took the opportunity to look around at the other passengers. He saw the men all staring, drinks and conversations momentarily forgotten; and the women also, jealousy evident in their gazes. All but Violet... her expression was more a matter of appraisal than jealousy. She was the only woman in the room, Will thought, who might compare favorably to Lily. "Yes," said Will, continuing to scan the others,"between the Mondabe totem and the entertainment, add to that the fact that we are flying above the ocean, this is an amazing trip thus far." Solo wrote: Greaves smiled. "The Totem, sir?" Tommy looks at Simon and says, "You read my mind." Tommy will also get dressed and will follow Simon out the door, although not directly behind him, to the Crew Bath and W.C. to do his morning routine. If the gentlemen are still there when he heads out the door he will briefly acknowledge them. After finishing his mourning routine, he will head to the kitchen for breakfast and hopefully a nice hot cup of coffee with a little cream and sugar, just the way he likes it.